Part three is a series. 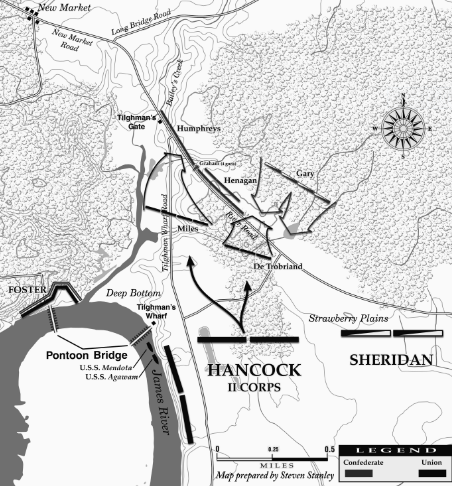 The First Battle of Deep Bottom– also occasionally called the Battle of Darbytown, Strawberry Plains, Tilghman’s Gate, New Market Road, Gravel Hill, and even Malvern Hill (the latter causing a great deal of confusion) – was part of Grant’s Third Offensive of the Richmond-Petersburg Campaign, which culminated in the infamous mine attack known as the Crater. It lasted from July 27-29, 1864. This entry was posted in Armies, Battlefields & Historic Places, Battles, Campaigns, Cavalry, Civil War Events, Common Soldier, Leadership--Confederate, Leadership--Federal, Memory, Navies, Personalities and tagged 1st Rockbridge Artillery, 24th Virginia Cavalry, 7th South Carolina Cavalry, Army of the James, August Kautz, Battle of the Crater, Benjamin Humphreys, First Deep Bottom, Gravel Hill, II Corps, John Hazard, Joseph Kershaw, Malvern Hill, Martin Gary, Nelson Miles, New Market Road, Philip Sheridan, Regis de Trobriand, South Anna River, Strawberry Plains, Tilghman's Gate, U.S. Grant, USS Mendota, Virginia Central Railroad, Winfield Scott Hancock. Bookmark the permalink. A good read; thank you .